Being an island Sri Lanka is surrounded by Sea and a perfect destination for a beach holiday. When the seas are rough on one side of the island there is calm waters on the other side. So it is a year round beach destination. The advantage of Sri Lanka as a Tourism Destination is Threefold. Firstly it is an authentic tourism destination. Secondly it is a compact island of 65,610 sq. km. 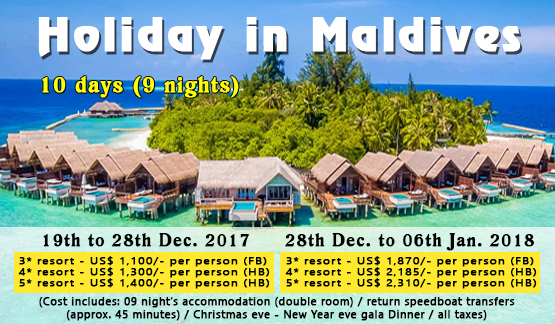 where a tourist can travel the length and breadth of the country within few hours, thirdly the diversity of the tourism product is unparalleled. For the simplicity of communicating the diversity of Sri Lanka, the Country is positioned around 8 different products, namely - Beaches, Heritage, Wildlife, Scenic Beauty, Mind and Body Wellness, Festivals, Sports and Adventure, Essence. The Essence of Sri Lanka include what is unique to the country such as its People, Art and Culture, Spices, Tea, Gems, Handy Crafts etc. Academy Award-winning film "The Bridge on the River Kwai" was filmed is in Sri Lanka. With a recorded history of more than 2500 years Sri Lanka has a rich heritage. 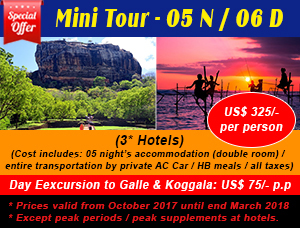 There are 8 world heritage sites within the country which include, the hill capital Kandy, The sacred city of Anuradhapura, The Dutch fort of Galle, The ancient city of Polonnaruwa, The rock fortress of Sigiriya, The golden rock temple of Dambulla, The beautiful Horton plains and The Sinharaja Rain Forest. Apart from these famous sites there are hundreds of heritage sites in the island which are frequented by tourists. For a small island the biodiversity of the country is most impressive. 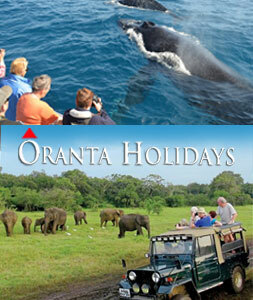 Sri Lanka is home for a wide variety of Mammals, Birds, Fish, Butterflies and Snakes. 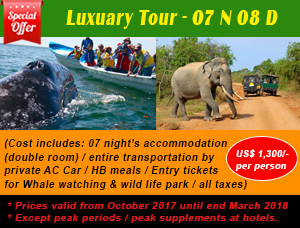 The big five Sri Lankan wildlife are the Elephant, the Leopard, the Sloth Bear, the Blue Whale and the Sperm Whale. Due to varying climate conditions and geography Sri Lanka is an ideal destination for Sports Tourism. Some of the popular sports include Golf, Surfing, Diving & Snorkeling, Hot Air Ballooning, Rafting and Canoeing, Scuba Diving, Fishing, Cycling, Hiking, Trekking and Rock Climbing. 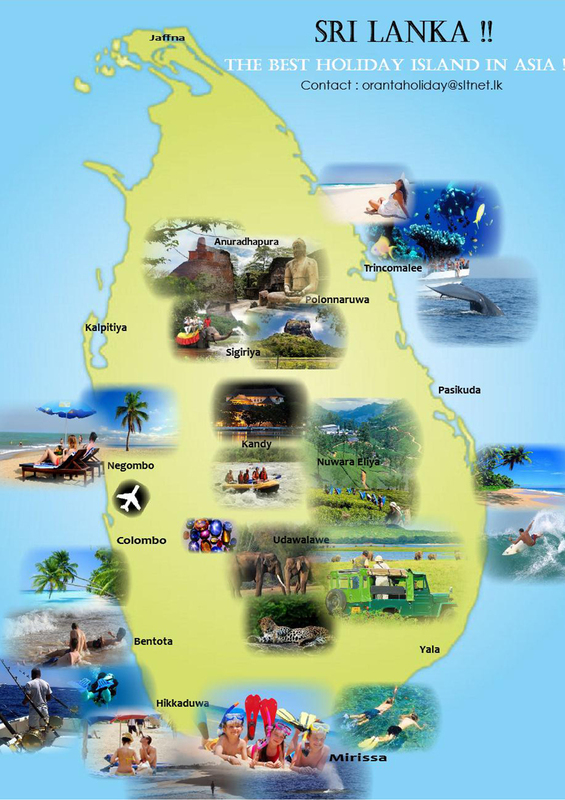 Sri Lanka is famous for Traditional Ayurveda hospitals and spas, yoga training and a large number of meditation centers. For a country where people practice four main Religions, Sri Lanka has always maintained religious harmony among communities. With Buddhism, Islam, Hinduism and Christianity are playing important roles in lives of people in Sri Lanka. The precious stones such as rubies and sapphires frequently found in Rathnapura and 90% of the rocks of the island are of Precambrian age, 560 million to 2,400 million years ago. Sri Lanka is the 3rd biggest Tea Producing Country in the world. The country is best known in the world market for the production of unorthodox tea. Tea was introduced to the country by the British who called the country "Ceylon". Pure "Ceylon Tea" is considered some of the finest tea produced anywhere in the world. Sri Lankan people are generally known for their hospitality. Most tourists admire the genuine smile of the people or Sri Lanka.